Between 1836 and 1865, approximately 55,000 Norwegians sailed to the United States. Like most immigrants, they sought opportunities that didn’t exist at home—religious freedom, economic security, land ownership, and educational and social advancement. Most of the emigrants were members of the lowest class, landless farmers who were subject to oppressive social conventions and treated with scorn in their native country. you in that distant safe harbor will get tenfold back. where the earth does not mock the sweat of its grower. and create desire to leave the North . . .
in the Norwegians’ new and happy home! Norway see, your homeland behold. will look down upon your wandering with blessings! scorn and shame, destitution and poverty. when you beckon them to come where you went. 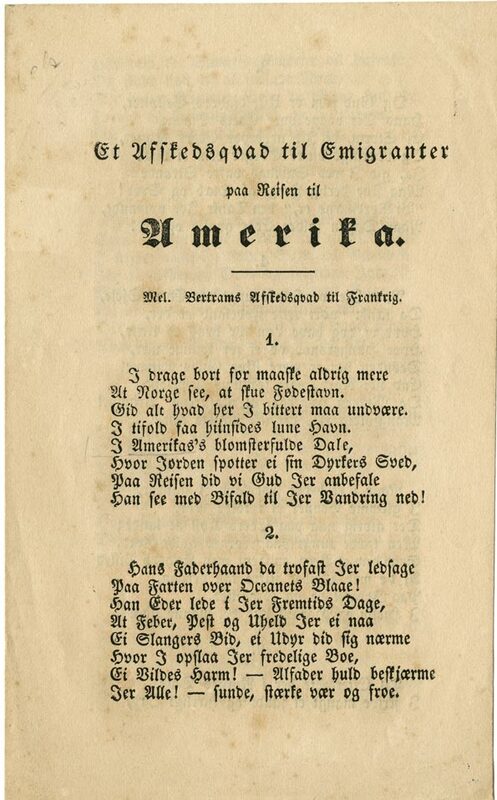 A translation of the poem is available here.
. Theodore C. Blegen, Norwegian Migration to America, 1825–1860 (Northfield, MN: The Norwegian-American Historical Association, 1931), 19–20.
. The verses are written in Danish, as Denmark had ruled in Norway for 400 years and Danish was the primary written language. After Norway split from Denmark in 1814, Norwegians developed their own written language, which gradually replaced Danish as the preferred literary language. To which economic class of Norwegians is this poem addressed? Describe the conditions in Norway that led the poet to commend Norwegians who left their homeland. According to the poet, in which ways will life be better for those who travel to America? 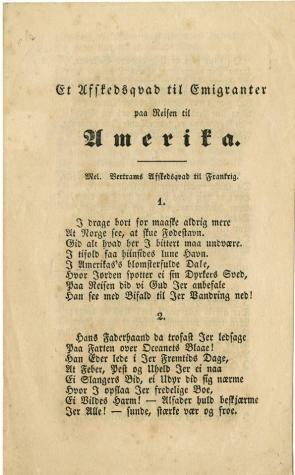 Why do you think the poet chose the form of an ode to express his opinion on the subject of Norwegian immigration to America? ​A printer-friendly pdf is available here.